Did you ever wonder exactly what goes on during ALL of those rehearsals? Usually a production is cast five or six weeks before the opening night. During the intervening time, the cast, the staff, and the PCPH board members put in many hours to get the show onstage. Rehearsals usually begin at 7 p.m. each evening. That means that the staff has to get there early to make sure everything is ready for the work that is planned. 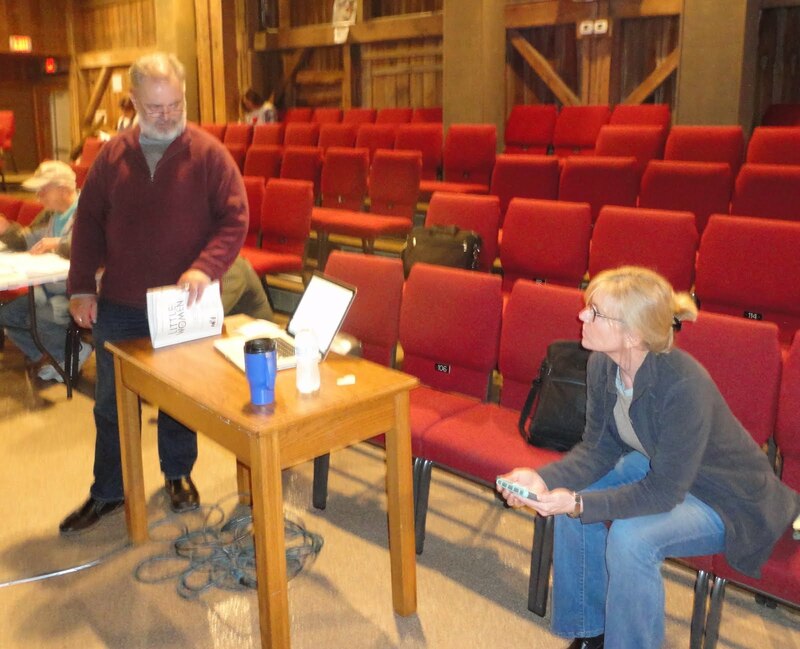 Little Women director Tim Good (center) and his assistants Jim Green (seated left) and Caroline Good (seated right) are the first to arrive. Tim has already set out the plan for the rehearsal, and everyone is prepared for the evening's work. 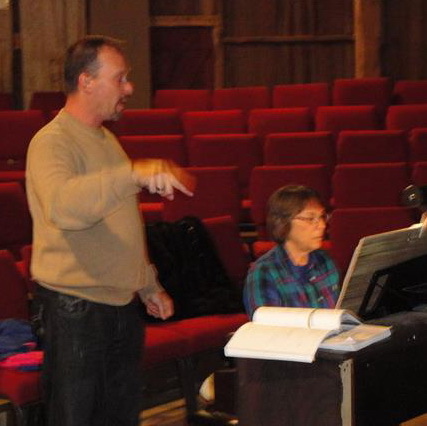 Other early arrivals in addition to Tim are pianist Amy Tharp and cast member Debby Lambert who plays Marmee. 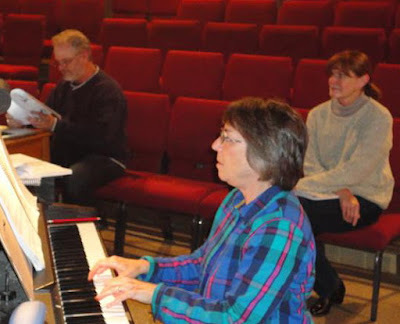 The rehearsal always begins with a vocal warm up. 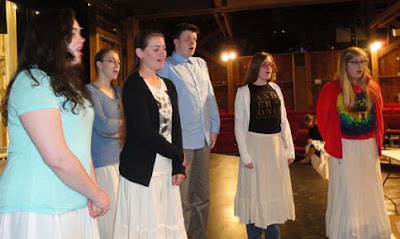 Ensemble members (L-R) JenJe Stouder, Haleigh Rowls, Anna Harris, and cast members David Maginity (Mr. Brooke), Michaela Semak (Beth) and Samantha Shelton (Young Amy) are onstage going through some vocal exercises with Amy. 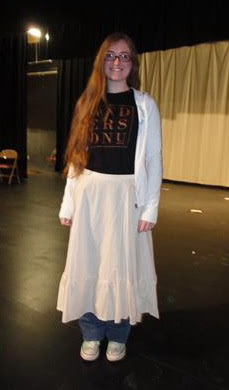 Because Little Women is a period musical set during the time of the Civil War, assistant director Caroline Good has provided rehearsal skirts so the ladies in the cast can get used to wearing a long dress. Here Michaela Semak, who plays Beth, models her skirt. 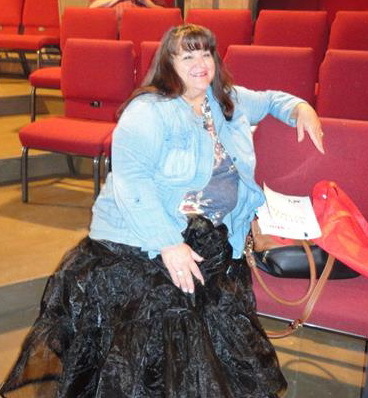 Angel Callan who plays Aunt March and Mrs, Kirk has a fancier rehearsal skirt than most. Musical/Vocal Director Erik Foster works closely with Amy and director Good to make sure the music and singing are working with the action onstage. This is the first PCPH show for both. We welcome them to our family! An actor might not be needed onstage during the entire rehearsal. When there is some down time, going over lines is a popular past time. Here Meghan Armitage (Meg) is checking her blocking and cues. As you can see by her shoes, tonight will include some dancing. 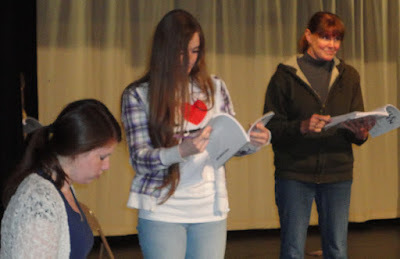 Once onstage Meg (Armitage), Beth (Semak), and Marmee (Lambert) get their blocking instructions and go through the scene. After two hours of intensive work, everyone is ready to go home. They'll be back the next night to work on a new scene, a new song, or a new dance. And so it goes until Opening Night! 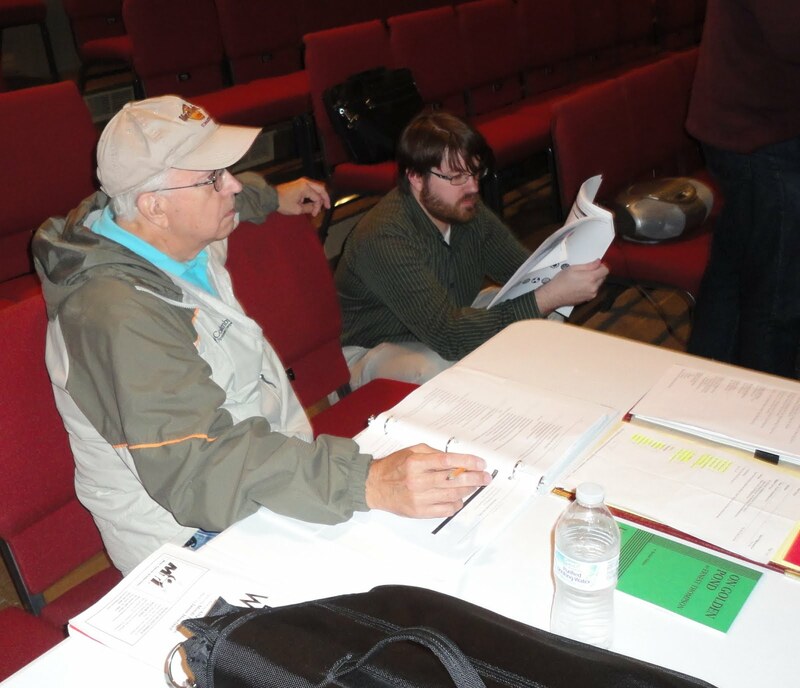 Green and PCPH Technical Director Dustin Bond stay afterwards to go over some cues. Bond also plays Professor Bhaer in the show. Little Women opens Thursday, June 2. 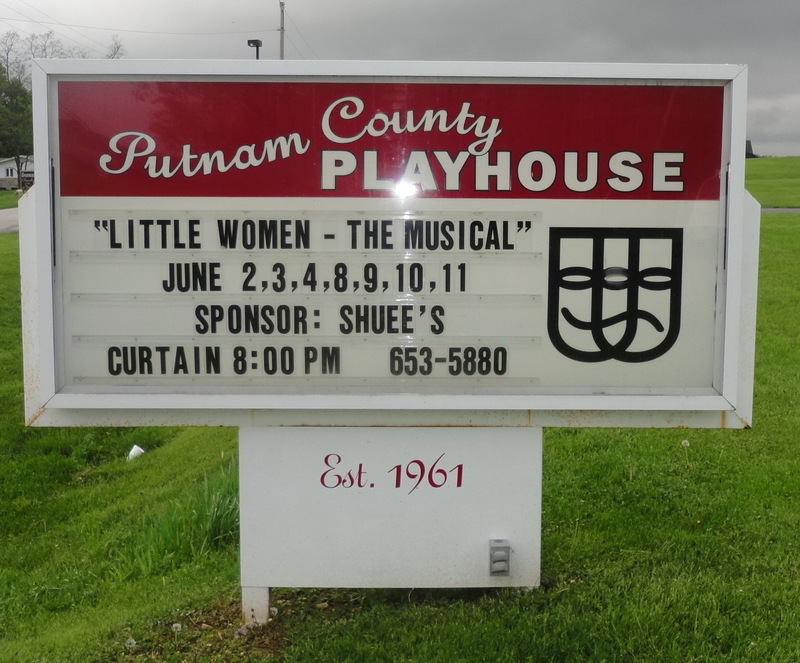 Individual tickets go on sale at the annual Putnam County Playhouse Open House on Sunday, May 29, at 1 p.m.